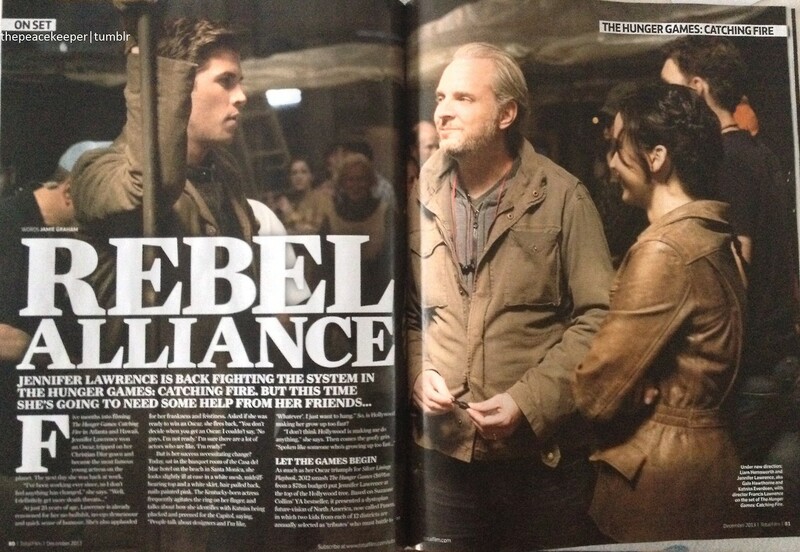 Another UK magazine with a huge exclusive Catching Fire feature! This time from Total Film. "We took the p--- out of each other all day long, just f---ed around," Hutcherson says, before adding, promptly, that everyone was professional and "focused on making the best movie possible for the fans." "Catching Fire is about the slow tension building beneath the surface, with the relationships as well as the rebellion. In this movie, you see more of Peeta and Katniss together than you ever did in the first one. It intensifies, the feelings become stronger." "We're so comfortable with each other, such good friends, that there's really not that much romanticism to it. But yeah, she's beautiful and it's a passionate moment and you want to feel real in that moment, so..."
"The heart of my pitch to the studio was that I was not looking to reinvent the book. Some people look at a book, take a loose version of the spirit of it, then throw it away and 'create'. I wanted to honour the book. I though it was very visual and cinematic. I thought there could be more sophistication to the clothing, and my version of naturalistic is very different. I like handheld, but I'm not into that shaky cam look. I tend to use wider lenses." "I think viewers will have much more of a sense of what makes up the arena, and what the boundaries are. It's much more a fabricated arena. It's this sort of tropical jungle in a bowl shape that surrounds a circular body of salt water with an island in the centre. The Cornucopia's on the island, with these spits of land that come out from it, and the tributes all rise up from these elevators in the water. Anything on the beach or in the jungle we shot in Hawaii. Then anything in the water or on the island we basically did at this water part that we found in Atlanta." "The arena is more of a threat to the characters so, because of that, there's a lot less person-on-person killing in this one. The important theme is the idea of allies and having to work with people you don't necessarily trust. Reliance on others versus reliance on self. It's still intense, but there's less violence. I'm more interested in somebody's reaction to violence or the consequence of it than the blood itself."